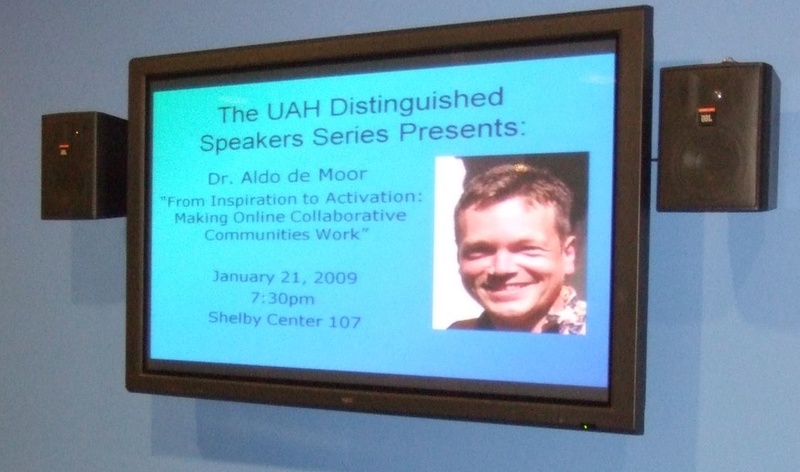 On January 21, I presented my lecture “From Inspiration to Activation: Making Online Collaborative Communities Work” in the UAHuntsville Distinguished Speaker Series. It was a revised version of the invited talk I gave at the ALOIS 2008 conference in Venice in May 2008. In the lecture I addressed how collaborative communities require not only the sense of purpose and drive provided by inspiration, but also the activation of the community in terms of explicitly supporting the initiation, execution, and evaluation of goal-oriented (online) communication processes. To this purpose, a socio-technical design process is needed in which the communicative context and tool system are matched. A major theme in my lecture was the paradigm-shifting approach of the Obama administration to involve the general public, not only in getting elected, but also in providing ideas for and feedback on the policies proposed. Key priorities are communication, transparency, and participation, which, not coincidentially are also the foundations of the field of community informatics. Only four years ago, this new reality seemed only but a distant dream. It is incredibly exciting to witness community informatics history in the making, right in the heart of our global democratic system! Although the Obama approach is a unique and most promising experiment on an unprecedented scale, it will need to go beyond current ambitions of soliciting feedback from individual citizens. In order to at least partially address the many highly complex, interlocking wicked problems like the credit crisis, global warming, poverty, environmental degradation and war, it will need to invest heavily in creating and nurturing a multitude of collaborative communities. These communities should bring together representatives of societal stakeholders such as government, science, corporations, NGOs, and so on. These communities should help them work together effectively and efficiently and break through organizational, political, disciplinary and ethnic boundaries. Only in this way can scalable solutions be developed that are workable and acceptable to the majority of people affected.